I didn't have any time for chit-chat, and having fun at the event. My competitive spirit kicked in, and all I could think about was the win. 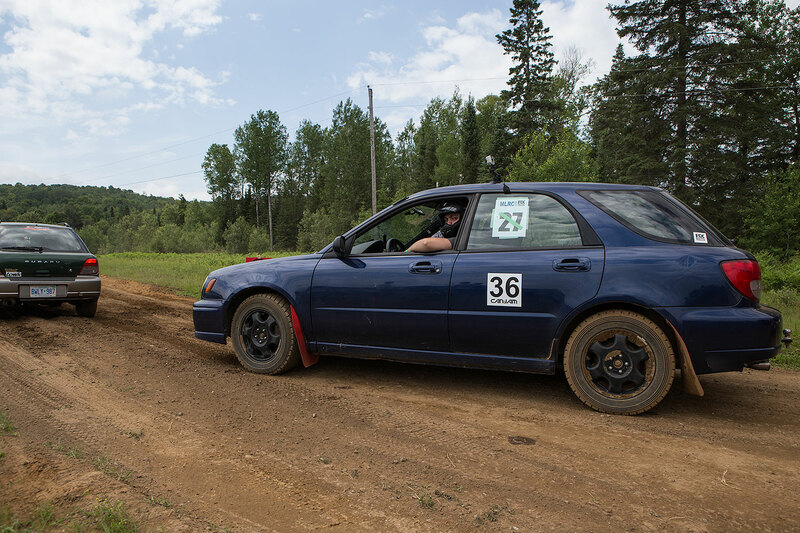 We put on our race tires, and I even set up my data logger for the first time ever at a rallycross so that we could look at the detailed nuances of every run, and figure out where we could gain time. In no time at all, it was time for my first run. Unlike autocross, you can't take it easy on the first run and learn the track - all runs count, so you have to be fast straight from the get-go. 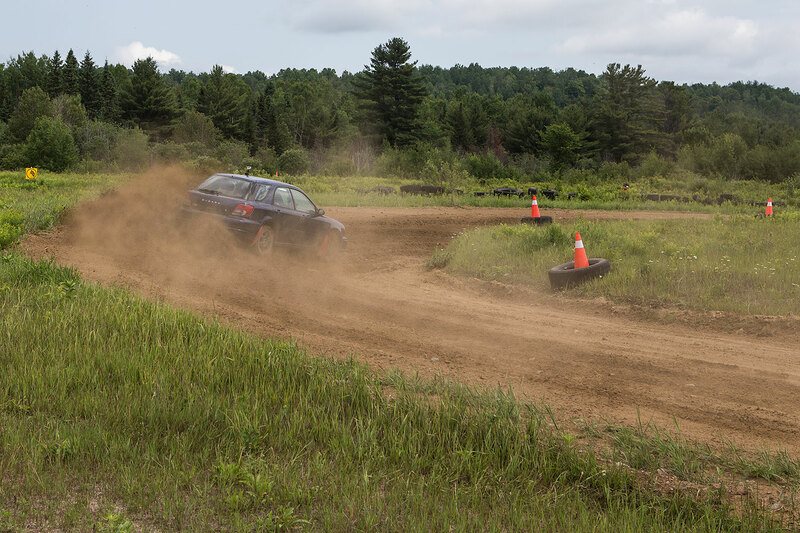 Plus the track conditions are best during the first run - all the more reason to make it a fast one. I lined up, watched the countdown, and went for it. 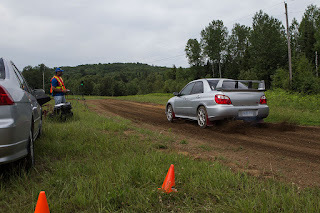 The surface was different from KWRC - it wasn't so much gravel, as a mix of sand and mud. 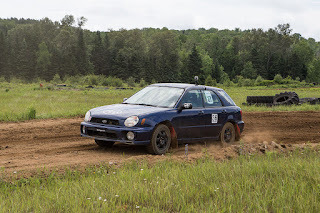 Regardless, our gravel tires coped beautifully, and in hindsight I could have been taken the corners even faster, especially on the first run before the track got beat up. I ran a 2:06.26. Was that good? Was that enough? Danil ran a 2:10.44 so at least I was ahead of him. As soon as the results for the first run were posted, we went over to have a look at Mat's - 2:06.03 - faster than me, but only by a couple tenths. I actually had a chance! And then we noticed the time put down by Zoltan - running in essentially the same exact car as us - a 1:59.88! That's over 6 seconds quicker! It was humbling to see that someone was so much faster than us in an identical car. 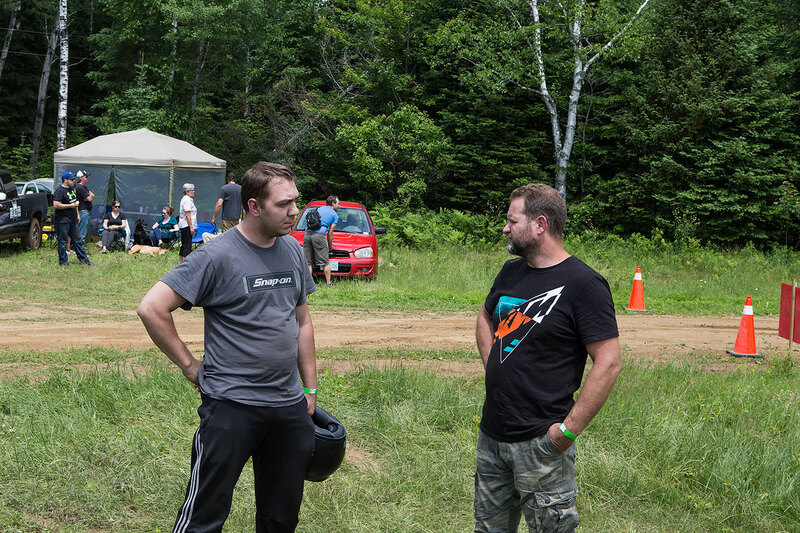 Luckily, Zoltan didn't run most of the rallycross season this year and was therefore too low on points to threaten my position in the championship. It didn't hold us back from wanting to run as fast though. We went over to speak to him, and in the spirit of camaraderie that never stops amazing me in this sport, he shared a lot of very useful pointers. I wished I could go for a run with him to see first hand what he was doing differently, but unfortunately his run was straight after mine and it was not possible. Danil however was running a few cars behind us, and he was able to go for a ride. He got out in pure awe at how fast Zoltan drove through even the riskiest sections where we couldn't help but hold back. With his newfound wisdom Danil got into the driver's seat and ran a 2:05.96 - our fastest run time of the day, beating his previous best run by an unbelievable 6 seconds. As we were pushing harder than ever to get closer to Zoltan's time, we got a serious wake-up call. 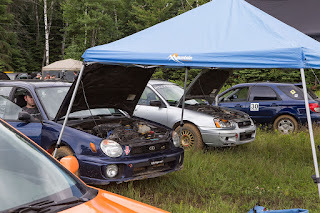 We were standing around the starting grid looking at an STi that was only a couple years old, but already had plenty of battle-scars on almost every panel. As we were talking about why someone would bring a car so new to a rallycross, we were approached by a guy who happened to be the owner. He told us that it's just his "toy" so he's not too worried about it, but that he was nervous about his son who was up next in the driver's seat. We wished him luck, and went on to contemplate our strategy for the remaining runs. 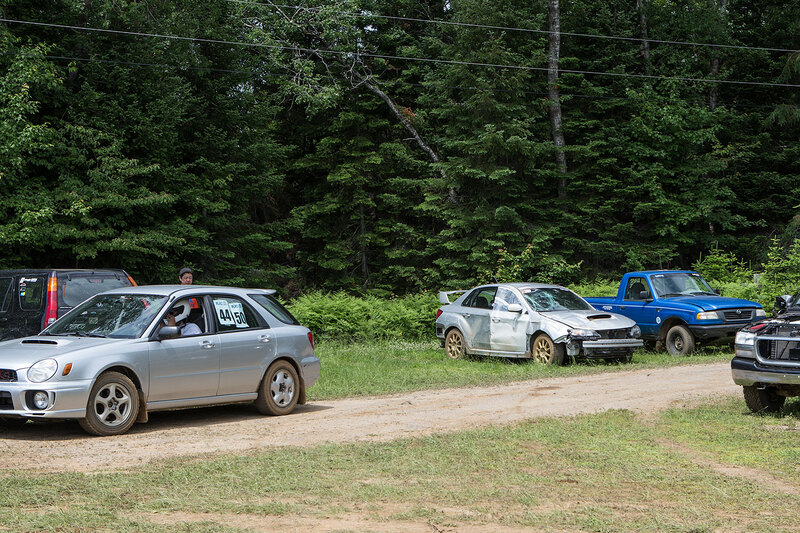 A moment later, we saw the STi leaving the forest section of the track, heading towards the finish with only 3 corners remaining. 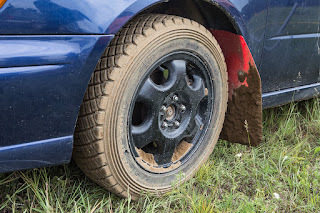 On the second-to-last corner - a tight, long right - he took a line that was too tight, clipped the dirt wall at the apex with the inside wheel, and over he went, rolling 360 degrees before landing on the wheels. The hood, fenders, and windows were smashed. Seconds later a group of marshals and competitors rushed over to help. Danil was standing closer, and was one of the first people to run over - he turned to me and screamed "bring the fire extinguisher!" I turned back, ran to the car, popped the hatch and unlatched the fire extinguisher we had mounted in the back. I ran over as fast as I could, watching the car and the clouds of smoke rising from it. 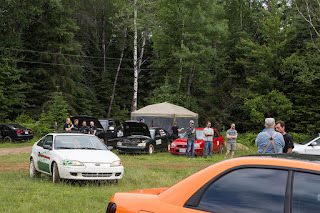 As I ran up, some of the guys already had the hood popped, and realized that it was just steam - the coolant tank burst, and coolant was evaporating off the hot engine. False alarm. The driver was alright too - a little shaken, with a cut on his elbow from the glass, but nothing serious. We decided that there's enough people at the scene, and we should give the marshals space to clean up, so we started walking back to the pits, absorbing what we had just witnessed. We got halfway back, when all of a sudden we heard the marshals screaming "fire! fire! bring the extinguisher!" I ran back even faster than before - it looked like the coolant that was only evaporating before, got to the hot turbo, and actually caught on fire. I emptied half the extinguisher onto the flame, which put it out for good. Glad we had that extinguisher handy. 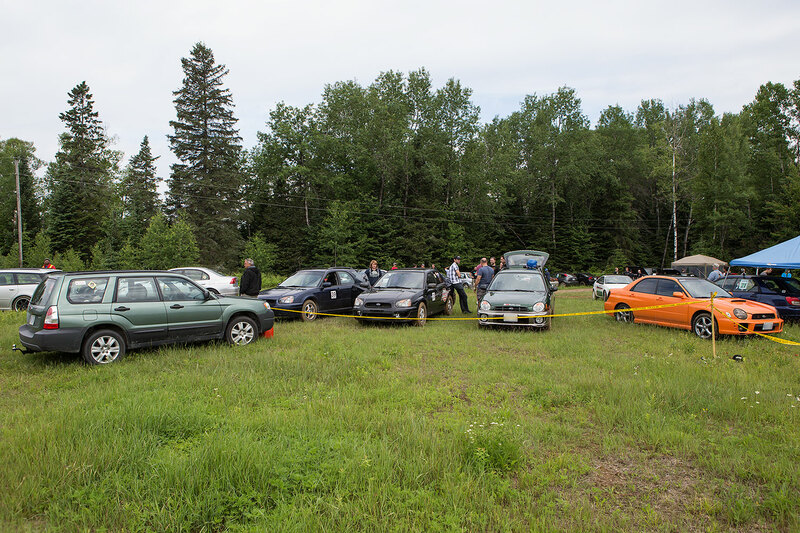 We spoke to the owner after his car was towed away, and the course was cleared. He was optimistic as ever - said "now I can just chop the roof off and put in a cage!" Always a bright side to everything I guess. Getting into the driver's seat after witnessing that crash was a bit unnerving. I knew that the speeds were so low that even rolling the car was reasonably safe. But I didn't want to experience that first-hand. Still, a part of my mind was focused on the championship so as the light went green, I didn't hold back on the gas. I did drive a bit more cautiously through the risky sections, and made sure to not corner close to the apex. As I checked my time, I confirmed once again that smoother is indeed faster - I ran a 2:06.32 - my fastest run of the day. 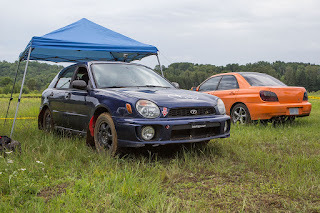 I was stuck running within a second off my first lap time all day, which felt disappointing but was actually good as the track conditions were getting dramatically worse. The car wasn't instilling any confidence in me either - our clutch hydraulics developed an issue where the pedal would not return back to its original position after being depressed only giving us about an inch of motion, and the clutch biting right at the floor. The reservoir remained full, so it was likely a master cylinder. We decided to keep driving it as-is as forfeiting at this point would have been too costly. At lunch, after doing 3 runs each we had a look at the lap times - the sum of Mat's runs was 6:20.88, while the sum of my runs was 6:19.68! I was actually in the lead! Not a very comfortable one, but I still had a chance. I asked Danil to sit out the run after lunch so that I can run in a lighter car, possibly shaving some more time off, and so he did. 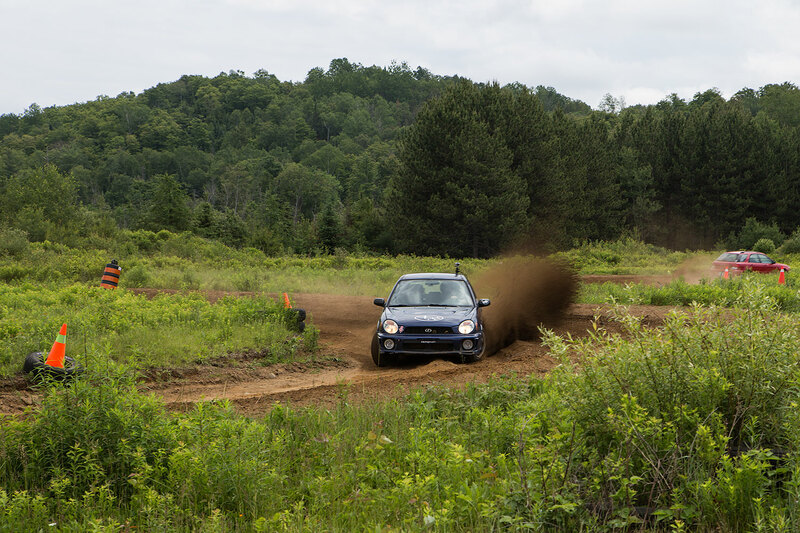 I got behind the wheel and focussed on making this a fast run. 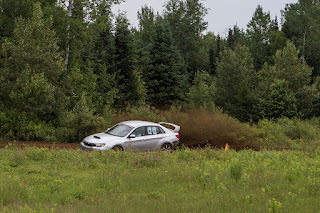 I had to make use of the now lighter car - braking later, and cornering faster. But at the same time I couldn't make any costly mistakes. Unfortunately the run didn't feel great - I hit a couple bad ruts that had me feeling I almost took the tire off the rim, and I generally felt like I wasn't on my A game. I got into the stop box, and had a look at the time - same 2:06 I was running before. Bummer. As I pulled out of the stop box I heard something even more disappointing - a loud, metallic "taka-taka-taka" coming from under the hood. We popped the hood and confirmed it was what it sounded like - engine knock. Damn! This was the engine we just put in a few weeks ago, too - granted it was one with a questionable history where the only thing we replaced were the timing belt and head gaskets. We agreed that running the car with engine knock would be silly, so we said goodbye to the championship and started packing our things. We didn't have a truck and had to get the car home to Barrie after all. As we pulled out of the pits the engine suddenly quieted down, and stopped knocking entirely! I revved it a couple times, and couldn't hear anything at all wrong with it. Maybe we were mistaken thinking it was engine knock? Maybe we could finish our runs after all? We decided we'd give it a try - worst case we'd call CAA and get it towed straight from the race. 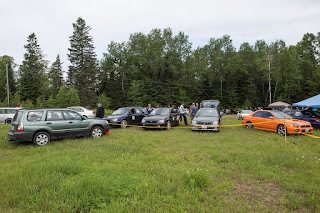 It was Danil's run next - we dumped all our things out of the car, and got back in line for our run. 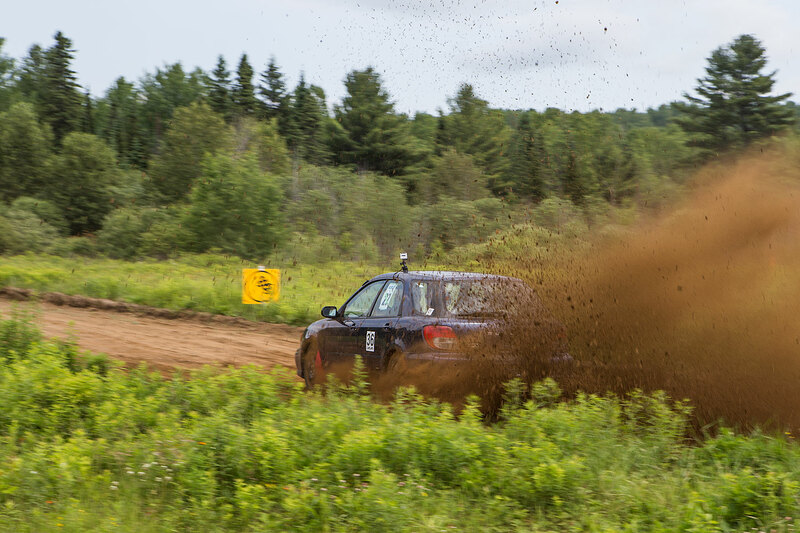 Seconds after we launched out of the start box, the noise returned - louder than ever. It was definitely engine knock, and the car would not survive any more runs. This time we packed for real, swapped back to our street tires, and decided to take the short way home - getting wherever we get to, and calling CAA when (at this point it was "when", not "if") we stop. I was driving, with Danil following in his WRX. Interestingly, the car felt completely normal if I kept it under 3K RPM - no noise at all. 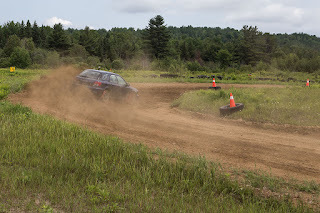 So that's the way I drove - barely touching the throttle, and always keeping it below 3K - a tall order for the hilly roads around Bancroft. 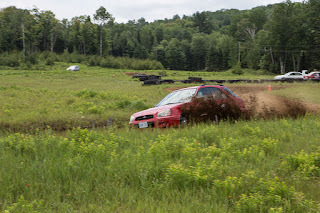 We got about 30kms out of Bancroft when all of a sudden, the knocking started getting louder, even if I kept it below 3K. I thought I'd see what it sounds like at idle, so I put in the clutch. The motor ground to a halt. I pulled off to the shoulder and walked over to Danil's car to tell him the news. We were about 190 kms from Barrie, which was great because CAA gave us a free tow of up to 200 kms. Unfortunately the shoulder I stopped on was barely wide enough for the car - not the safest spot to be standing and waiting for CAA to arrive. Fortunately we were stopped at the top of a very long hill. 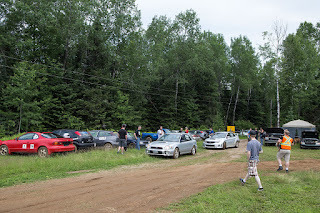 We spotted a sign that pointed to a boat launch on the left, somewhere at the bottom of the hill and decided to take Danil's WRX to check it out. Indeed about a kilometer down the hill there was a very nice spot to pull into to wait for the tow truck to arrive. Two problems though - 1) we didn't bring a tow rope, so we'd have to coast down the hill and to the boat launch, and 2) the boat launch was on the left side of the road which meant we'd have to cross oncoming traffic with no chance to stop as we'd lose all momentum and would get stuck in the middle of the road. Luckily there was two of us. I've asked Danil to position himself in a place where he could see both far into the direction of oncoming traffic, and where he would be visible to me. He would then signal to me whether the road was clear, and if it wasn't I'd stop far enough up the hill so I could restart once the traffic passed. Danil got into position, while I got back to the car. He gave me a call to tell me he was ready, and I let off the brakes and started slowly gaining momentum - hazards on, car halfway on the shoulder. As soon as I started moving, a group of motorcyclists came over the hill behind me. I saw the turn to the boat launch in the distance, with Danil signalling that the oncoming traffic was clear, just as the motorcyclists started slowly and cautiously passing me on my left. I was worried whether they'd finish passing when I came up to the boat launch. But the last one passed just in time for me to make the left turn. Phew. The flatbed arrived about an hour later, and the wagon was taken safely back to our garage. We lost the championship. 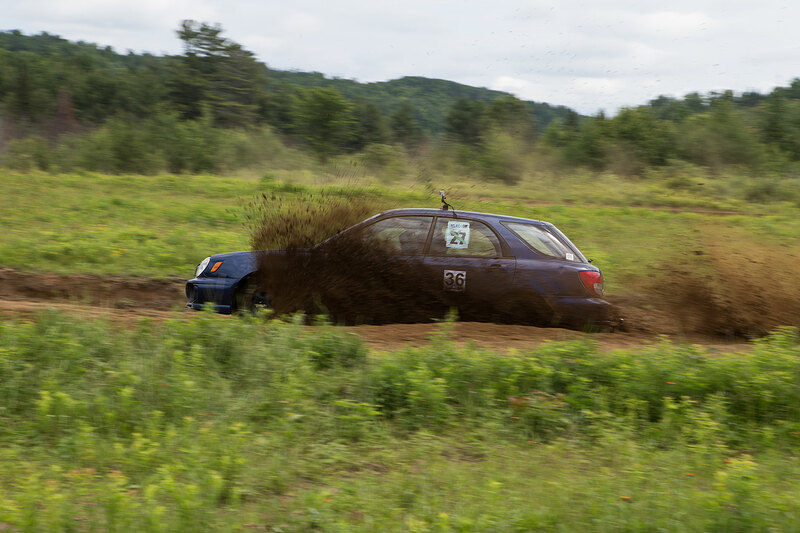 But in the spirit of looking on the bright side - we can now put in that EJ20 we had lined up for the wagon in the first place, without worrying about getting bumped up into the Turbo AWD class.